The Russian State Library holdings take up an entire block in Moscow, accommodating tremendous collections of books, which are currently being digitized. The oldest building in the complex – the Pashkov House – is teeming with legends. Starovagankovsky Hill is perhaps the only spot in Moscow that actually overlooks the Kremlin. Until 1564, a house owned by a member of Ivan IV (the Terrible’s) guards – an oprichnik – topped the hill. It was later replaced by the tsar’s residence, Oprichny Court. It is believed that Ivan the Terrible’s famous library, the Liberia, might have been buried here. Legend has it that the library, originally the property of Byzantine emperors, was moved to Rome after the fall of Constantinople, and later transferred to Moscow as part of the dowry of Sophia Palaiologina, the bride of Ivan the Terrible’s grandfather, Grand Prince of Moscow Ivan III. The lost library still captures the imagination of writers and journalists. Whether as a tribute to this legend or merely by mystic coincidence, a few centuries after Ivan the Terrible’s reign Russia's largest public library was built on the hill. 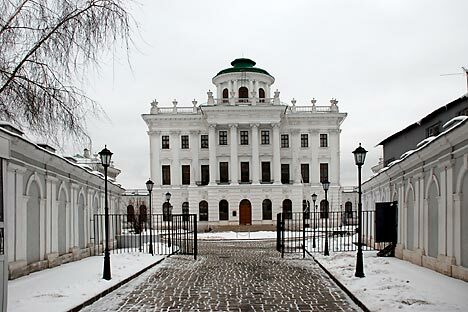 In the late 18th century, a mansion was constructed here in the Classical style for Pyotr Pashkov, an officer of the elite Semenovsky Life Guards Regiment. It is one of the most beautiful and impressive buildings in Moscow and possibly in all of Russia. Designed by Vasily Bazhenov, the architect of the Mikhailovsky (St. Michael’s) Castle in St. Petersburg and Catherine II’s Tsaritsyno Ensemble and Park in Moscow, the Pashkov House has survived virtually intact. In 1862, the Pashkov House became the home of the library of the Rumyantsev Museum. Count Nikolai Rumyantsev, the museum’s namesake, was the owner of a unique collection of books, manuscripts and coins, as well as ethnographic and other collections. Often referred to as the Columbus of Russian antiquities, he didn’t just buy up various rare objects, but was also a historian and cultural scholar. He bequeathed the entire treasured collection “to the benefit of the Fatherland and virtuous enlightenment.” These words still decorate the front of the Pashkov House. After Rumyantsev died in 1826, the collection, in accordance with the philanthropist’s will, was handed over to the state, and Emperor Alexander II later ordered the transfer of the museum from its original premises in St. Petersburg to Moscow. Russian writer Leo Tolstoy was one of library’s regular visitors. Until 1939, the library even had a Tolstoy study, which housed the writer’s manuscripts, which had been donated to the museum by his wife, Sophia Tolstaya. 41,315,500 items take up a storage area equal to 9 football fields. There are 29,830 repository items per employee. You would have to spend 79 years without sleep or rest to take a minute-long cursory glance at each repository item. The library’s reading rooms and computer desks can simultaneously provide workplaces for passengers of 4 trains. It would take 25 trucks to move the library’s computer equipment. After the 1917 Revolution, the Imperial Moscow and Rumyantsev Museums were dissolved. The library and the manuscript departments were renamed the Lenin Library and awarded the status of state archives. Taking advantage of these new privileges, the library amassed all the abandoned, derelict and nationalized book collections, thus increasing its holdings fourfold. In fact, the Lenin Library was even authorized to keep manuscripts and books banned by the Soviet censors. This may be the only reason why the precious works of talented authors blacklisted in the Soviet Union – émigré scholars, philosophers, writers, artists and members of the various literary societies and associations that were abundant in the 1920s – survived the years of repression and ideological purges carried out by the Soviet leadership. In the 20th century, a new depository had to be built because of an acute lack of space. The building was not yet finished when World War II broke out, but librarians, wary of the possibility of fires in the wooden Pashkov House, rushed to move the archives into the new concrete structure. There was no mechanically assisted way to move the collections, so the women who worked at the library had to carry over 600 boxes filled with books by hand every day. In the late 20th century, the Pashkov House was severely damaged by the construction of the Borovitskaya metro station. As the tunnels were dug, the ancient foundation gave way and sagged, and the ceilings cracked. Moscow authorities started renovations, but soon ran out of money, and the work stalled. “Before the restoration effort, an underground railway connecting the Pashkov House and the main library building was used to carry books. Some 10 years ago, as old timers say, young trainees would go down to have a smoke in the tunnel, sitting on trolleys there. The rails and the trolleys have now been removed, however, but the tunnel is still there,” remembered library employee Valery Manzhos. The Pashkov House was restored by 2007, with the help of private funds, and it currently houses a museum of rare books, as well as sheet music and maps. Yulia Vishnyakova, a fellow in the Rare Book Research Department, said: “We keep valuable books, the monument books: lifetime editions of Albrecht Durer or Alexander Pushkin. We are also proud to have an 1855 edition of Krylov’s famous fables.” The fable book was printed using a silver typeface to print the book. The pearls of the repository are the Elzevirs – books produced at a Dutch printing shop owned by the Elzevir family in the late 16th century. Their distinguishing feature is a smaller, portable format convenient for travel. The entire Lenin Library boasts over 40 million repository items, with a small portion of them already digitized. The digitization process is ongoing, and it is expected to be completed by 2015. All the existing electronic materials are available online. This does not mean, however, that the library will be deserted, and books will merely be collecting dust on shelves. So far, e-books can hardly beat the romance of printed pages.